Economic analysts have faulted the managing director of the International Monetary Fund (IMF), Ms Christine Lagarde, saying that the country’s debt to GDP ratio was in the balance, therefore, can raise funds from the bond market to finance development. 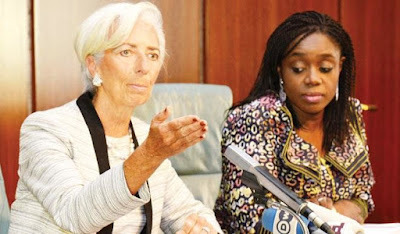 Lagarde had expressed concern over Nigeria’s debt profile, advising the federal government to be careful with its borrowing plans. crude oil at the international market. However, the chief executive officer of Financial Derivative Limited, Bismarck Rewane, while welcoming the IMF’s chief visit, said Nigeria’s can borrow more to bridge funding gap. Also, a development economist, Odilim Enwegbara, described Lagarde’s advice as misleading, explaining that the country as at now, is creditworthy and can borrow as high as $270 billion during the next four years without being debt trapped, stressing that the Debt Management Office (DMO) of Nigeria has been effective in the management of the country’s debt portfolio. According to him, “this is however dependent on if our debt remains project-driven, particularly infrastructure-based loans that by reducing our current infrastructure deficit, reduce the present high cost of doing business and high interest rate causing high arbitrage. “I was instead expecting her to insist on government justifying borrowing by borrowing purely for investment rather than for consumption. “Ms Lagarde needed to have applauded the Buhari administration for its bold efforts to drastically increase investment in capital projects which he wouldn’t be able to do without having to borrow,” he said.